Apple’s iTunes may not be everyone’s favorite music player or media management tool, but for millions of iPod, iPad and iPhone owners it is the software they use to work with their music collection. We have all experienced problems with MP3s to one degree or another -- a library littered with duplicate tracks, albums that have no ID3 tags, tracks with misspelt name to name but a few -- and this is something that Real Networks’ Rinse can help with. This is an Adobe Air application that can be used to analyze and fix your music library, comparing the information attached to your files with an extensive online database. If you are the sort of person who likes to remain in control of what is happening with your computer, you may want to work through your music collection one track at a time, confirming any suggested changes that Rinse comes up with. But if you have a particularly gigantic music collection, or if you simply don’t fancy the idea of sitting in front of your computer confirming every change, you have the option of working in automatic mode. 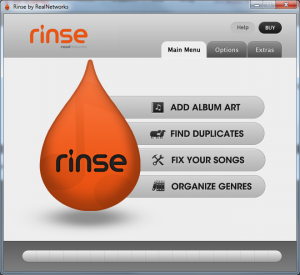 Rinse can also prove useful if you have used other music management tools in the past only to discover that your music genres have gone awry. If you have been plagued by missing album art or multiple copies of the same track, Rinse makes it easy to get things back in order. The application does nothing that you could not achieve manually, but it will save you a great deal of time and effort if you leave it to work its magic. The tool is a little on the expensive side at $39, but the results it comes up with are impressive. You can find out more and download a copy of the program by paying a visit to the Rinse review page.